Lovely spacious apartment with fantastic views from the living room, kitchen and bedroom. The apartment is 2 hours drive from Malpensa airport in a quite spot on the lake, there is a small local bar and a lakeside bar within 2 mins walk. The apartment is lovely and big with great views of the lake, there is a busy road separating the apartment and the lake but it didn't bother us at all. The busier resort of Menaggio is a 10 min drive for restaurants, supermarket, lido, boat hire and ferry. The apartmemt is in a great spot for a quiet/relaxed holiday with easy access for exploring the area we visited Venice and back in a day. The owners are really helpful even giving us a lift to Menaggio to catch the ferry across the lake for a Italian cookery lesson we had booked. All in all a very nice apartment with fantastic views in a quite but accessible spot on the lake and if you like swimming in lakes this apartment is perfect for it! The apartment is very spacious and well equipped with a small beach along Lake Como directly opposite and small grocery store, cafe, bank, chemist and 2 restaurants within easy walking distance. 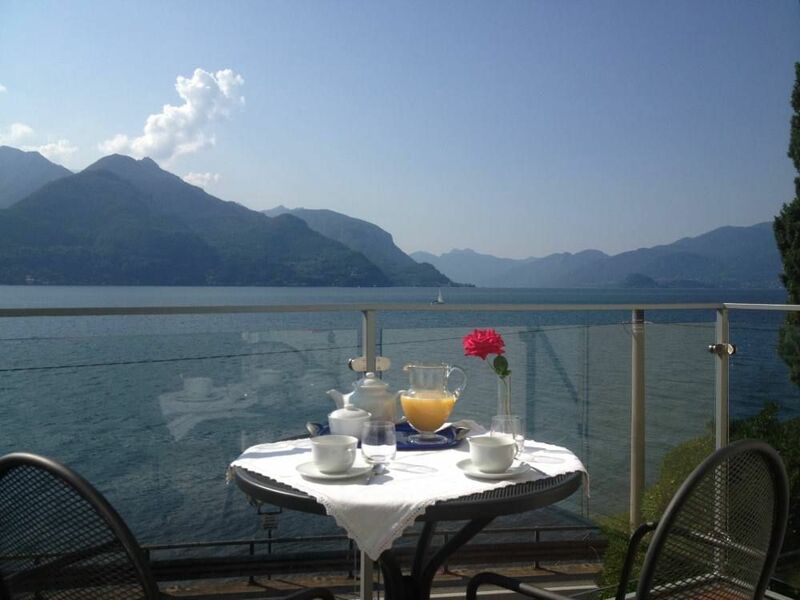 The owners are very helpful and it is an ideal base for visiting the various towns along Lake Como. The road is busy but you just need to take extra care when crossing and it did not take away from what was a very enjoyable stay. The only improvement possible would be a dish washer. Eine sehr schöne Ferienwohnung mit traumhaftem Blick auf den See und eine sehr hilfsbereite, nette GAstgeberin- unbedingt zu empfehlen! Nur die Straßeist etwas lauft- aber die Zimmer nach hinten hinaus sind zum Schalfen ok! Santa Maria , van hieruit verschillende plaatsen met de boot gaan bezoeken rond het comomeer ,met een beetje opzoekwerk kan je wat veiliger fietsen rond het comomeer en blijf je vd drukke baan weg, de woning was netjes alles was aanwezig , zeer vriendelijk en behulpzame eigenares , rechtover de woning een mogelijkheid om aan het meer te vertoeven , minpunt is de drukke baan . Très bon accueil des hôtes et d'une grande serviabilité! Logement très agréable, bien agencé et propre avec une magnifique vue. Eine grosse und schöne Wohnung mit einer wunderbaren Aussicht. Der Kontakt mit der Vermieterin sehr gut. Wir haben alle Infos schon vor der Abreise von Zuhause bekommen. Die Umgebung ist wunderschön. Man kann den See geniessen und in die Berge gehen. Leider wohnt man über einer lärmigen und gefährlichen Strasse, die man jeden Tag überqueren muss. Ausserdem gibt es fast kein warmes Wasser unter der Douche und um sich und Haare zu waschen brauchte man enorm viel Zeit. Wir waren nur 4 Tage, dann konnte man es noch gut ertragen. (Text automatically translated) Coming from Como (A9 motorway - exit COMO NORD) or Lugano (CH) you get to Menaggio. Continue towards Sondrio, along the lake. After 4 km you enter the town of SAN SIRO crossing locations: Acquaseria, Molvedo. Before the church of St. Mary the house is on the left. For those coming from S. Moritz lake or top after passing Domaso, Dongo, and Cremia you enter the town of San Siro. After the church of Santa Maria stop at the second house.